The SpaceX Dragon is a spacecraft developed by SpaceX, a space transportation company in Hawthorne, California. In December 2010, it became the first spacecraft ever placed in orbit and recovered by a private company. The first operational Dragon missions will be flown for NASA to deliver cargo to the International Space Station. Dragon is designed to carry up to seven people, or a mixture of personnel and cargo, to and from low Earth orbit. These flights will be contracted under the Commercial Resupply Services program. Dragon's heat shield is designed to withstand re-entry velocities from potential lunar and Martian space flights. Development was partially funded through a Space Act Agreement under NASA's Commercial Orbital Transportation Services program. Dragon is a conventional blunt-cone ballistic capsule with a hinged nose-cone cap which opens to reveal a standard International Space Station (ISS) Common Berthing Mechanism. It allows the Dragon to be captured by the Space Station Remote Manipulator System and berthed to the non-Russian segments of the ISS. This approach avoids the weight, cost and complexity of an on-board docking system such as the Androgynous Peripheral Attach System (APAS-89) or the Low Impact Docking System (LIDS). The Dragon capsule is launched atop a Falcon 9 rocket. SpaceX has built a full-sized prototype of the capsule and "thoroughly tested" its life support system. In June 2009, SpaceX CEO Elon Musk stated that the company planned to conduct the maiden flight of the Dragon spacecraft in 2009, and have the capsule enter service in 2010, before the scheduled final flight of the Space Shuttle. On February 23, 2009, SpaceX announced that its chosen heat shield material, PICA-X, a proprietary variant of NASA's phenolic impregnated carbon ablator material, had passed heat stress tests in preparation for the first Dragon launch. In 2010 SpaceX's Elon Musk stated that the "Dragon is capable of re-entering from a Lunar velocity, or even a Mars velocity with the heat shield that it has." 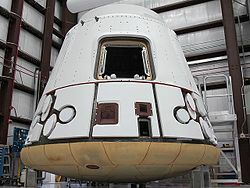 The first flight of a stripped down version of the Dragon capsule occurred in June 2010 on the Falcon 9's maiden flight. This Dragon Spacecraft Qualification Unit was originally used as a non-flying test bed to validate several of the capsule's systems. At first flight, its primary mission was to relay aerodynamic data captured during the ascent. The Dragon spacecraft itself first flew on December 8, 2010, during the second flight of the Falcon 9. The docking target system for the Dragon module, the DragonEye, was tested during STS-127 by mounting it near the docking port on Space Shuttle Endeavour and using it while approaching the International Space Station. The DragonEye's LIDAR and thermal imaging capabilities were both checked out. The DragonEye is slated to fly again on STS-133, currently scheduled for February 2011, for further testing. On November 22, 2010, NASA announced that the FAA had issued a reentry license for Dragon, the first such license ever awarded to a commercial vehicle. In preparation for crewed use of the Dragon, in summer 2009 SpaceX hired former NASA astronaut Ken Bowersox as vice president of their new Astronaut Safety and Mission Assurance Department. In 2009 and 2010, Elon Musk has suggested on several occasions that plans for a manned variant of Dragon were proceeding and had a 2-3 year timeline to completion. For its initial cargo and crew flights, the Dragon will land in the sea and be air-lifted to the shore by helicopter. SpaceX plans to eventually install deployable landing gear and use the vehicle's thrusters to perform a land-based landing. 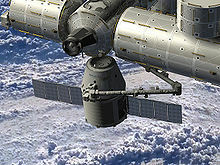 Picture - Artist rendering of SpaceX Dragon spacecraft delivering cargo to the International Space Station. In 2005, NASA solicited commercial rocket companies to submit proposals for resupply of the International Space Station after the retirement of the Space Shuttle. 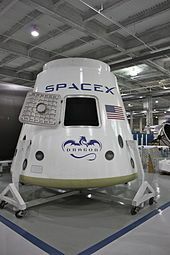 Dragon is part of a proposal submitted by SpaceX in March 2006 for NASA's Commercial Orbital Transportation Services (COTS) program for commercial delivery of cargo to the ISS. SpaceX's team for the COTS proposal consisted of a number of companies including MD Robotics, and the Canadian company that built the ISS's Mobile Servicing System. On August 18, 2006, NASA announced that SpaceX had been chosen, along with Kistler Aerospace, to develop cargo launch services for the International Space Station. The plan called for three demonstration flights of SpaceX's Dragon capsule between 2008 and 2010. SpaceX may receive up to $278 million if they meet all NASA milestones. Kistler failed to meet its obligations with NASA, and its contract was terminated in 2007. NASA decided to re-award Kistler's portion of the contract after a competition. On February 19, 2008 NASA announced that it had chosen Orbital Sciences as the new winner. NASA awarded a cargo delivery contract to SpaceX on December 23, 2008. The contract calls for a minimum of 20,000 kg (44,000 lb) of cargo over up to 12 flights to the ISS at a cost of $1.6 billion USD, with options that increase the maximum contract value to $3.1 billion. The first of the three contracted demonstration flights was successfully flown on December 8, 2010.
the provision of escape capability later into the launch profile, "all the way to orbit"
the escape engines may be usable during the landing phase "for a precise land landing of Dragon under rocket power." The emergency parachute will be retained in this design as a redundant backup landing system. A video simulation of the escape system operation has been released. Picture - The maiden launch of the SpaceX Dragon on the Falcon 9. On December 8, 2010, a Falcon 9 rocket carrying an unmanned SpaceX Dragon lifted off from Cape Canaveral in Florida on COTS Demo Flight 1. The launch was a success, and the Dragon cleanly separated from the Falcon approximately 10 minutes after launch. Three hours of orbital maneuvering testing were conducted at an altitude of 300 kilometres (190 mi; 160 nmi) before a deorbit burn was conducted, putting the Dragon on a re-entry course that ended in a successful splashdown in the Pacific Ocean, approximately 800 kilometres (500 mi; 430 nmi) west of Mexico's Pacific coast. SpaceX president Gwynne Shotwell stated that this was the first of three primary flight tests. NASA maintains that the Dragon will not be permitted near the International Space Station until its safety has been proven. Though the Dragon capsule transported neither passengers nor practical cargo, the Space X team launched the spacecraft with a small piece of secret payload. It was revealed more than a day after the successful flight that the secret cargo was a wheel of Le Broux�re cheese. The stunt was said to be an homage to the well-known Cheese Shop sketch from Monty Python's Flying Circus. SpaceX's CEO would not reveal identity of the cargo during the post-splashdown news conference for fear of the joke overshadowing the company's accomplishments in the next day's headlines. 18 Draco thrusters, dual-redun�dant in all axes: any two can fail and still have complete vehicle control in pitch, yaw, roll and translation. PICA-X heat shield designed to withstand reentry of return velocities from Lunar and Martian destinations. The uncrewed capsule version of the Dragon spacecraft, when it is used for commercial (non-NASA, non-ISS) flights, is named DragonLab. It is capable of carrying pressurized and unpressurized payloads, is free-flying, and is reusable. "Subsystems include propulsion, power, thermal control, environmental control, avionics, communications, thermal protection, flight software, guidance, navigation & control, entry, descent & landing, and recovery." 6,000 kilograms (13,000 lb) total combined up-mass; 3,000 kilograms (6,600 lb) maximum down-mass returned to Earth. Environmental: 10-46 degree Celsius (50-115 �F); relative humidity 25~75%; 13.9~14.9 psia air pressure (958.4~1027 hPa). Sensor bay hatch opens after orbital insertion to allow full sensor access to the space environment, and closes prior to reentry to Earth's atmosphere. Will support sensors and space apertures up to 3.5 m (11 ft 6 in) in diameter. Power: 1,500 W average, 4000 W peak, at 28 and 120 VDC via twin solar panels. As of December 2010, the SpaceX production line is manufacturing one new Dragon spacecraft every three months.